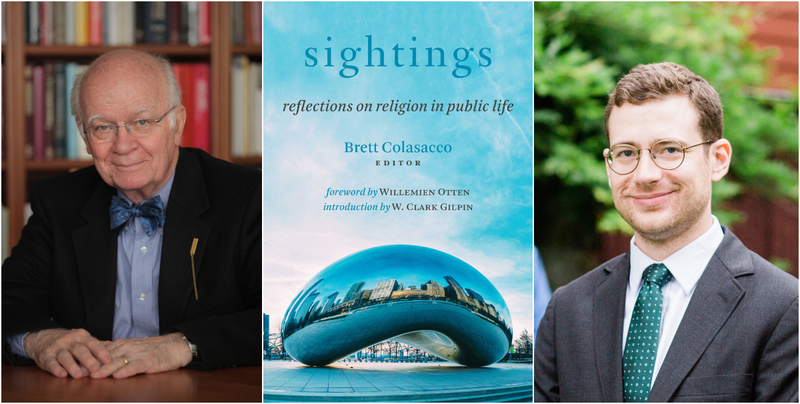 A discussion with Brett Colasacco, editor of Sightings: Reflections on Religion in Public Life. He will be joined in conversation by Martin E. Marty, Willemien Otten, and Richard A. Rosengarten. A Q&A and signing will follow the discussion. About the Book: For the past twenty years, Martin Marty and the editors of Sightings, a digital publication of the University of Chicago Divinity School’s Martin Marty Center, have published informed, accessible, and witty commentary on religion in current events. Featuring more than seventy authors—including Marty himself, Eboo Patel, and Krista Tippett—this book collects one hundred of the best essays that originally appeared in Sightings. About the Editor: Brett Colasacco is former editor of Sightings, a twice-weekly publication of the Martin Marty Center for the Public Understanding of Religion. He has a PhD in religion, literature, and visual culture from the University of Chicago, where he currently works as a writer. About the Authors: Martin E. Marty is the Fairfax M. Cone Distinguished Service Professor Emeritus of the History of Modern Christianity at the University of Chicago Divinity School. Author of more than fifty books, he is one of the most prominent interpreters of religion and culture today. He was the weekly columnist at Sightings for twenty years and remains a monthly contributor. Willemien Otten is professor of theology and the history of Christianity at the University of Chicago Divinity School. She is director of the Martin Marty Center for the Public Understanding of Religion. Richard A. Rosengarten is associate professor of religion, literature, and visual culture at the University of Chicago Divinity School. He is a monthly contributor to Sightings.